In the western side of the island of Rhodes, approximately five kilometers south east of the village of Theologos (or Tholos), lies the Valley of the Butterflies. This is one of the most attractive destinations on the island. During August, thousands of butterflies of the genus Panaxia (species Quadripunctaria Poda) overwhelm the valley in order to reproduce. A landscape of unspoiled beauty, difficult to find elsewhere on Rhodes. The village itself is small and well-kept, built in the form of an amphitheatre at the southern and of the wild western coast. The main attraction of the village is the mediaeval castle, standing among the pines on the great outcrop of an isolated rock from which the name Monolithos (lonely rock) is derived. Lindos is for most visitors the most impressive archaeological site on Rhodes. Here the dramatic natural landscape is enhanced by the picturesque quality of the more modern town. You will find the most important archaeological monuments at the acropolis, but interesting ruins are scattered at various points within the town and just outside it as well. he beautiful historic island of Rhodes is an absolute must on any Greek island odyssey. In addition to its many gorgeous beaches, such as Ixia bay, Haraki , Anthony Quinn and Agathi there are unspoilt villages to explore and the largest inhabited medieval town (old town of Rhodes) in Europe, Rhodes City's World Heritage-listed old town, to savour. Rhodes City has an impeccable pedigree - in 408 BC it was planned by the architect Hippodamos, who came to be regarded as the father of town planning. Today its heart is the old town - a mesh of Byzantine, Turkish and Latin architecture, with labyrinthine alleyways and bustling squares - enclosed within massive walls. It's divided into the Knights' Quarter, where the Knights of St John lived, and the Hora, where everyone else lived. You'll need to get up early to beat the crowds, but it's well worth the effort. The imposing cobblestoned Avenue of the Knights , with its inns and palaces, exudes the noble and forbidding aura of the crusades. Visit one of the area's museums, themselves housed in historic buildings, for a quick history lesson on what you're seeing. The Hora is home to various Ottoman legacies, including the newly renovated, pink-domed Mosque of Suleyman, built in the early 16th century. The new town also hs its share of ancient wonders: it features the Acropolis of Rhodes , which contains a restored 2nd century stadium and the Temple of Pythian Apollo. Over 600 discos and bars provide a modern-day connection to the traditional Dionysian spirit. Just outside the city there's a myriad of other attractions. Lindos , 47km (29mi) from Rhodes, is a major tourist destination. Its Acropolis is the most famous of the Dodecanese's ancient cities, receiving 500,000 visitors a year. The Acropolis is spectacularly perched atop a 116m- (380ft) high rock. The site's most important ancient ruin is the 4th century Temple to Athena. Pedestrianised Lindos is well set up for visitors, with banks, restaurants, some (expensive) accommodation and even its very own donkey terminus to ferry people to and from the Acropolis. Get there early or late to avoid the worst of the crowds. If you're desperate for the smell of high-rise hotels, fast-food joints and bars, head to Rhodes' premier resort, Faliraki Beach . If you're heading down the west coast, give the windy beaches south of Monolithos a miss. Instead, plonk yourself down on a quiet stretch of the 11km (7mi) of almost uninterrupted beach between Gennadi and Plimmyri on the east side of the island. Gennadi, though becoming touristy, is still a charming stop-off, with narrow, winding streets of whitewashed houses and an olive-press museum. Take some time out from sun worshipping to see fine 13th-century frescoes at the nearby 9th-century Moni Thari, the island's first monastery, which has recently been re-established as a monastic community. 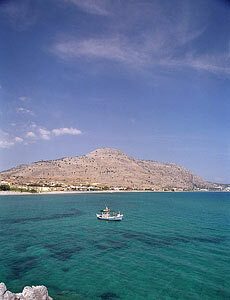 Right on the southern tip of Rhodes, Prasonisi (Green Island) is a great spot for windsurfing. The interior of Rhodes offers great scenery, traditional villages and very little traffic. If you have transport, take the time to do some exploring. One of the most scenic day trips you can make is the route to Mt Profitis Ilias and Salakos across the north central highlands. Petaloudes (Valley of the Butterflies) is one of the most attractive destinations on the island. Should you be there during July and August, please do not disturb the buttreflies as they consume valuable energy and die before they can reproduce, which leads to a rapidly declining population.